Books and articles by and about the actors who starred in the Little House on the Prairie TV series provide a behind-the-scenes look at the show and how it affected the lives of the people making it. Here is a brief overview of Diary of a Stage Mother’s Daughter: A Memoir. The Glass Castle meets The Battle Hymn of the Tiger Mother in this dazzlingly honest and provocative family memoir by former child actress and current Fox Business Network anchor Melissa Francis. When Melissa Francis was eight years old, she won the role of lifetime: playing Cassandra Cooper Ingalls, the little girl who was adopted with her brother (played by young Jason Bateman) by the Ingalls family on the world’s beloved television drama, Little House on the Prairie. Despite her age, she was already a veteran actress, living a charmed life, moving from one Hollywood set to the next. But behind the scenes, her success was fueled by the pride, pressure, and sometimes grinding cruelty of her stage mother, as fame and a mother’s ambition pushed her older sister deeper into the shadows. Diary of a Stage Mother’s Daughter is a fascinating account of life as a child star in the 1980s, and also a startling tale of a family under the care of a highly neurotic, dangerously competitive “tiger mother.” But perhaps most importantly, now that Melissa has two sons of her own, it’s a meditation on motherhood, and the value of pushing your children: how hard should you push a child to succeed, and at what point does your help turn into harm? Broadcast journalist Melissa Francis is also the author of Lessons from the Prairie. She is an anchor on Fox News Channel and Fox Business Network, and a regular contributor on financial, economic, and political issues. As an actress, she appeared in numerous motion pictures, television series, and more than a hundred television commercials, and is best known for her role as Michael Landon’s daughter, Cassandra Cooper Ingalls, on “Little House on the Prairie“. She lives in Manhattan with her husband and their three children. 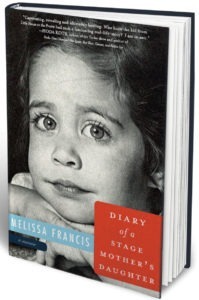 Pick up your own copy of Diary of a Stage Mother’s Daughter: A Memoir here.